"Shoftim v'sotrim..." "Judges and officials... will judge the people with righteous judgment." The first line of this parasha addresses those whose jobs are to enact the laws enumerated in the lines that follow. Why, asked the ancient rabbis, does it specify both judges AND officials, since judges are the ones who make the actual decisions? Because decisions are only part of the job. Judgment must be acted upon to have any meaning, and that's the job of the officials—they bring those decisions to life. 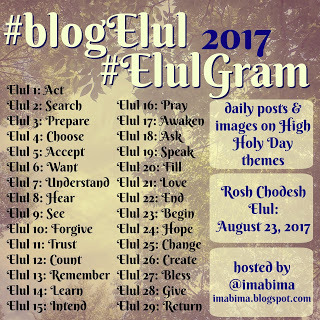 During this month of Elul, offered my rabbi, our task is not only to vow to make changes, but also figure out how to manifest them. We need to step beyond ourselves, like a magistrate watching a judge, and try to understand how to best bring those decisions to life. It's never easy. We can't just accept that we know what's right ("Yes, I have to eat fewer cookies. Yes, I need to do more good in the world. ). It can feel so good to come to those conclusions!--they often require long, hard journeys, and we want to just sigh and sleep when we finally get there. But awareness is only the beginning of the task.